When the spring vegetables become available at the farmer’s market, I just want to do a little happy dance. Usually the winters have been long, and so we all have been patiently waiting for the produce that is truly candy for the eyes. 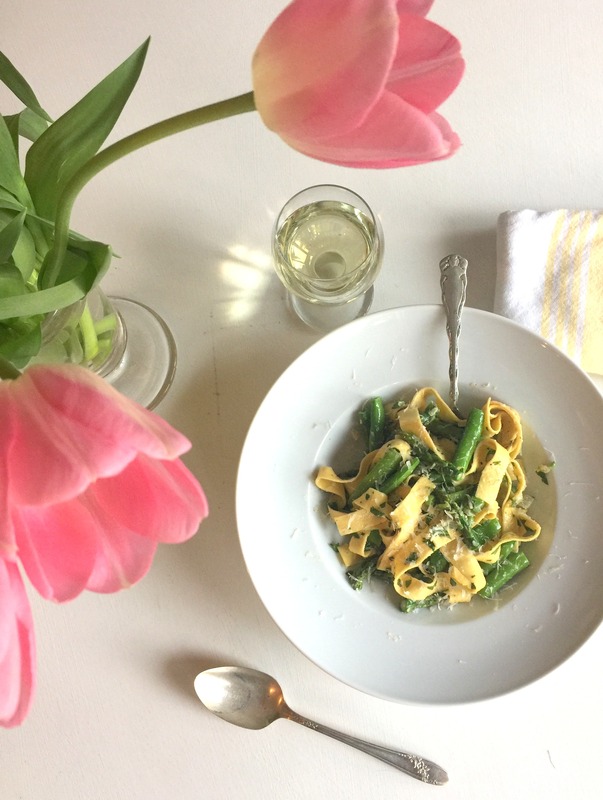 It becomes hard to choose which vegetables to purchase for the week, and the good news is when looking to make the first spring pasta of the season, simply pick your favorite and freshest veggies. 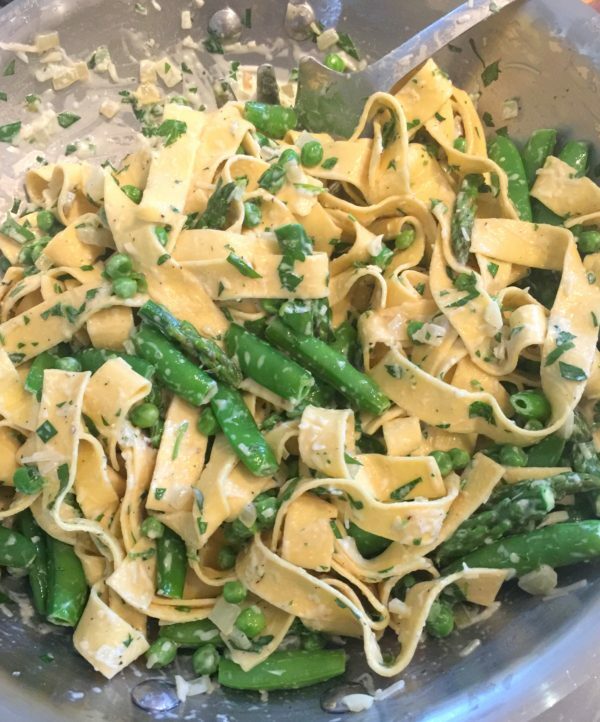 For my recipe I have added asparagus, sugar snap peas, English peas and a spring onion. In one dish you have your starch and your vegetables (low-starch) with a touch of creamy cheese. The recipe is Melissa Clark’s of The New York Times, and there is a reason more than 800 people have given it glowing reviews. 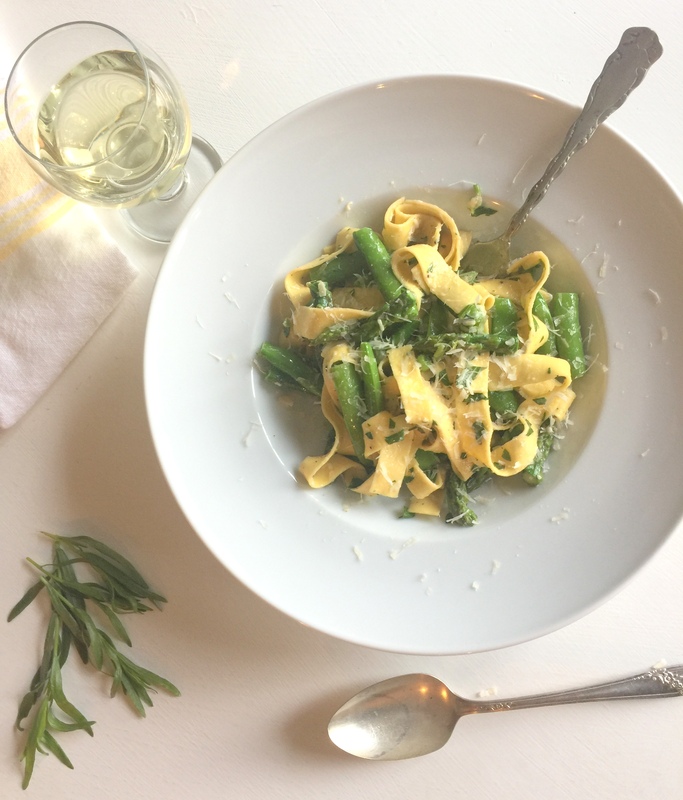 While perhaps partially due to the simplicity to create it, the flavor is spectacular due to the finishing sauce of crème fraîche, Parmigiano-Reggiano and fresh herbs. 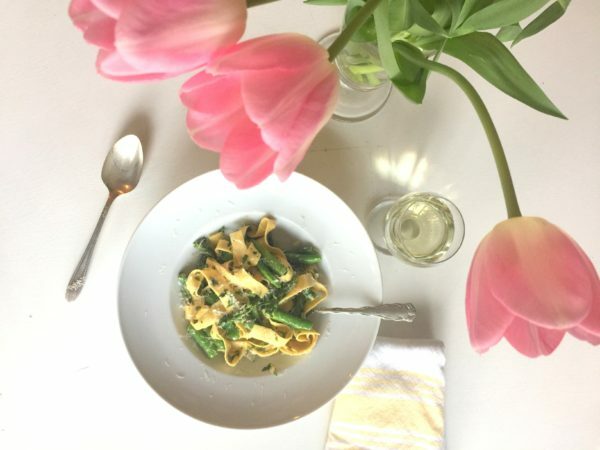 In fewer than 20 minutes this dish will be on your table to enjoy with a glass of white wine and a smile as you savor concluding the day with simplicity and satiation. Bon appétit! Prepare a large pot with salted water and bring to boil. While waiting for the water to boil, prep the spring vegetables. Substitute other fresh vegetables found at the market per your preference and availability. Melt butter in a large skillet over medium-high heat. 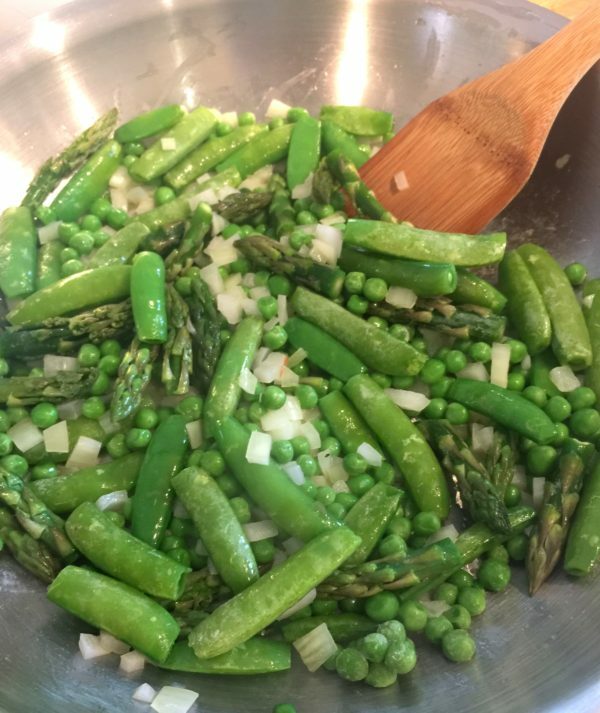 Add sugar snap peas, asparagus, English peas and onion. Cook until the vegetables are barely tender (not until they are soft), approximately 3-4 minutes. Stir in garlic and cook 1 minute more. Season with salt and pepper, then set aside (do not remove from the warm pan, but do remove the pan from the heat). Drop the pasta into the boiling water and cook until al dente (1 to 3 minutes for fresh pasta, otherwise read the label on the bag/box). Drain well and place on top of the warm vegetables in the skillet. 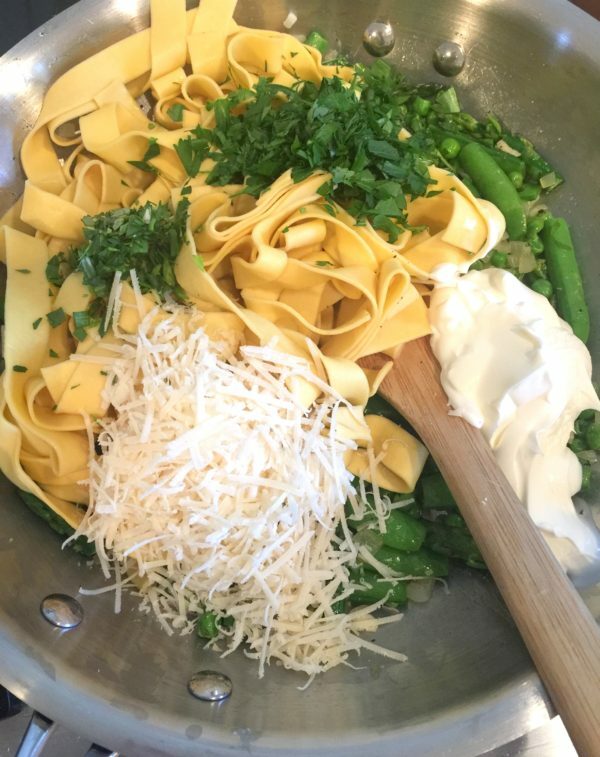 Immediately toss pasta with the vegetables, Parmigiano-Reggiano, crème fraîche and herbs. Season to taste with salt and pepper. Sprinkle a bit of Parmigiano-Reggiano on top, serve and enjoy!